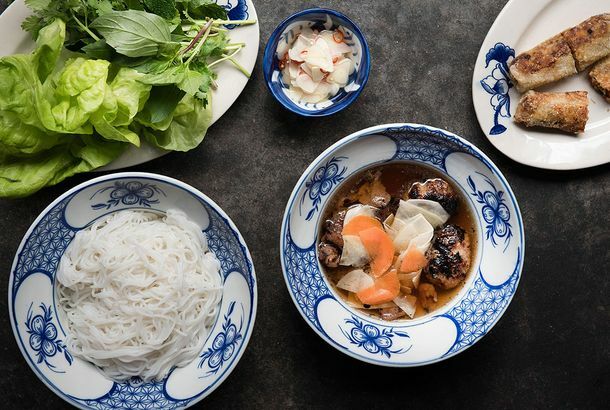 Review: The Cooking at Hanoi House Tastes Fresh, Homespun, and InventiveChef John Nguyen has a knack for imbuing familiar recipes with a combination of elegance, integrity, and first-class cooking technique. 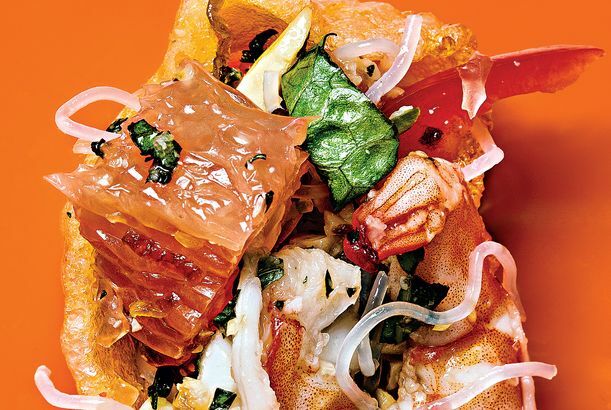 The Absolute Best Vietnamese Restaurants in New YorkIt appears that a new era of congeelike chao, turmeric-oil-stained catfish, and pillowy, empanada-like bánh gi is upon us. The Absolute Best Bánh Mì in New YorkSix versions of the classic sandwich that are a cut above the rest. Tip Top Sandwiches Expanding To Fountain ValleyBut why are these bastions of banh mi still eluding the city? Spice Table’s Banh Mi Stoppage Induces SeizuresBryant Ng slowly builds his empire. Rotisseur Starts Serving Lunch Today; Opa Does the Same Next WeekRotisseur is unveiling two new sandwiches, and Opa wants you to have lunch on them. E. Coli Outbreak Kills Fourteen in Europe; Food Prices Trouble VenezuelaPoor citizens of the South American nation are spending half of their salaries on food. Food & Wine Sings the Praises of Green Aisle; Le Virtu Starts SellingThe south Philly grocer earns some ink and lands a deal with Le Virtu. Renovations Will Bring More Vendors to Reading Terminal Market; Banh Mi ArePlus a Delaware Congressional candidate wants to know if groundwater pollutants are increasing cancer rates, and Japanese brewers concoct a 120 proof beer, all in our morning news roundup. Did the Founder of Ba Le Bakery Invent the Bánh Mì?The restaurant claims to have invented one of the most popular sandwiches in the world. Fresser’s Truck Pulls Off the Road; Nom Nom NappingThe road could be getting rocky for L.A.’s biggest foodie fad when a pastrami truck can’t cut it. Ba Le Cafe Opening Today in UptownBa Le’s banh mi empire expands south. Nom Nom Truck Collaborates with Compartes ChocolatierA food truck tries to sweeten Valentine’s Day shopping. Vietnamese Home Cooking Truck Serves Pho for the PhamishedA new caterer-on-wheels offers more than banh mi. The New Paris Sandwich May Just Be the Über–Bánh MìCrêpes! American sandwiches! And a high-tech ordering system! Bánh Mì Bomb: Paris Sandwich Drops Second LocationThis one also has a Yolato Express. More Bánh Mì in the EVBánh Mì Zòn opens on 6th Street with a menu that serves more than Vietnamese sandwiches. Villa di Roma’s Frank DeLuca Will Die for an O Sandwiches Banh Mi or Two“I was eating one a week for a while. I had to stop, though, because I went up to two a week and I was gaining weight! Get Your Banh Mi Delivered in High StyleFashionist blogger takes on a second career as a sandwichist. Coconut Water Could Be The Next Bottled Water; PETA Teases McDonald’sBeverage companies hope coconut water will replace bottled water as the next big thing, and PETA enlists stars to go after McDonald’s. Nom-Nom Truck Reveals Itself TonightLos Angeles finally gets it banh mi to-go with the arrival of Nom Nom. Bánh Mì Beef: Hanco’s Accuses Henry’s of Foul PlayIs Park Slope’s latest bánh mì shop a designer imposter? Jumbo Hot Dog Raises Prices, Shatters Our WorldviewIt’s the end of an era. Nom Nom’s Vietnamese Food Picks in SoCalWho influenced the cuisine of the Nom Nom Truck? Tortally Ridiculous: GQ Details Says Torta MayAnd Los Dados is the best New York contender? Sandwich Craze Spirals Out of Control, Collides With Salad WorldPlus, win $25,000 for a sandwich recipe. Today in Asian-Sandwich ExcessProvince Chinese Canteen is reborn in midtown. Bread Lines: Bánh Mì Newbies Shut Down Viet-Nam BánhNewcomers to the Vietnamese sandwich craze are depriving loyalists of their comfort food! P&G Cafe Gutted; Per Se Makes List of World’s BestPlus: ‘Food Network Magazine’ grows, and Habana Outpost returns, all in our morning news roundup.